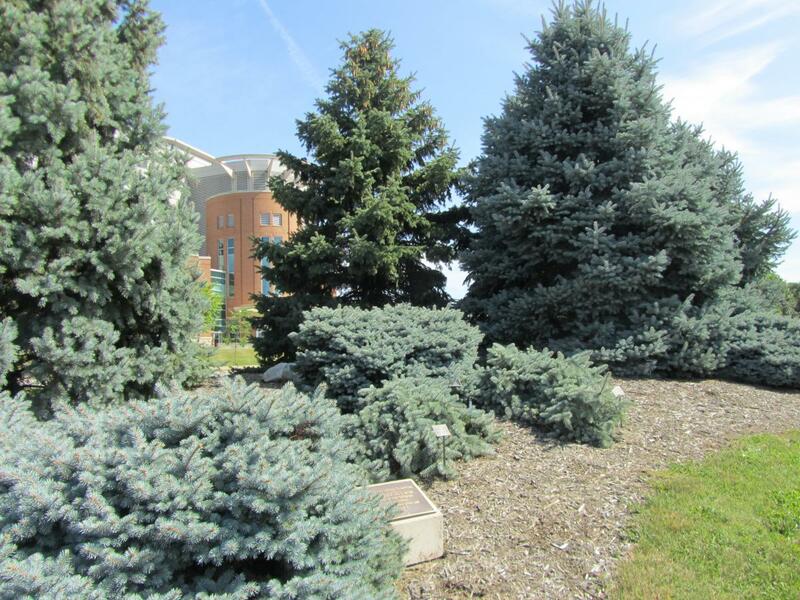 The Lynn E. McCall Colorado Spruce Collection, near the southwest corner of Lane Avenue and Olentangy River Road, provides a true living memorial. Ohio State University was dear to Lynn McCall's heart. In 1949, he graduated with a business degree, grateful for the many lifelong fraternal friendships, as well as the fine career opportunities that his college had afforded him. He and his future wife, Georgeann, met in their senior year. Graduating together, they became OSU Alumni Association Life Members. They spent their lives enthusiastically cheering our Buckeye teams on to victory. Like Lynn, Georgeann also found serenity in gardens and places of natural beauty. After Lynn's death in 1992, Georgeann looked at the Chadwick Arboretum as an ideal place to honor Lynn in a garden that is in close proximity to many of their favorite athletic venues. This collection of spruce cultivars was given by Georgeann "Cal" McCall and her children Michael, Scott, Leslie, and Lynn on April 26, 2002, to honor her husband and their father, Lynn E. McCall. Lynn's ashes were interned at the site during the ceremony so that he would forever be part of The Ohio State University. This "green" Colorado spruce is a wild-type and one of the few green foliage Colorado spruce. This pyramidal evergreen accent tree or large shrub serves as a bold, green focal point in the landscape, especially among the silver or blue foliage types. Click Picea pungens for a photograph and one or more links to information about this tree from The Ohio State University Plant Facts, Wikipedia, and/or USDA Plants Database. Or click Plant Search Database and simply enter the botanical name (genus only will work) of any tree on The Ohio State University Columbus campus. If you do not know a tree's botanical name, you can find it by searching the web using the tree's common name. We are in the process of adding QR codes to our plant labels throughout the arboretum. If you are walking in the gardens and see a plant label with a QR code, use your smart phone or tablet QR reader app to access a photograph and description or link to additional information about the tree. If you don't have a QR reader app, you can download one for free from your app store.